As part of our Americana series, each state will gradually be added with a composition representative of it places, symbols, images and more. 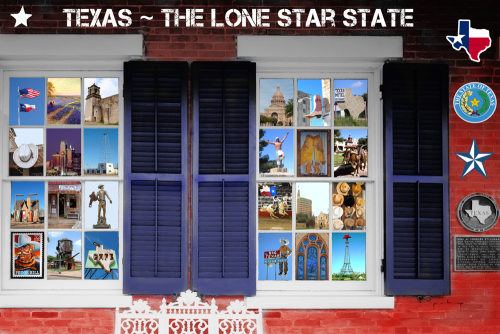 Our first in the series goes to Texas -- The Lone Star State, in honor of that is where this artist was born. The background is a restored and colorized vintage photo of a historic building in Texas. Current and vintage images were placed atop the window panes, symbols were added to the side, and text along the top. Composition by Kathy Weiser-Alexander.